So I have been meaning to build a wall deck for a while now, and have settled on Ayli, Eternal Pilgrim as the general. And it just dawned on me that she and this deck are perfect for spoofing Trumpisms. First I have to build a bunch of walls, then I have to make America "great again" by gaining 10 more life than my starting life total. Once I do that I can spend my time exiling all obstacles in my way. Here's the crappy concept Trump art I made. Justice cannot be done without including the comb over. The power and toughness being hidden is a nice touch. Let me just say that certain things have been said about his power and toughness, and I guarantee you that there is no problem. I guarantee it. 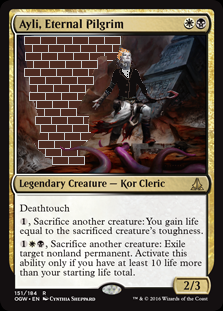 My friend wants to make a group hug deck now with Bernie Sanders aka Zedruu to pit against Ayli, Eternal Pilgrim. I think the fact that he's not human is a nice touch.